Overview: Enabling app users to capture photos after each scan allows administrators to add a visual history within a formal scan record that can include the date, time, location (optional) and other form data (aka ‘Questions). Photos can be captured with or without Internet connectivity during the scanning process. Note: Photo Verification is discussed at the end of this article. A record does not have to be initiated with scanning barcodes or reading RFID/NFC tags. You can also simply enter an ID via text or voice, or use the app’s Lookup option to quickly find the name or ID of the asset, person or object for which you want to create a record. When using an online service type the app user must wait for the image to upload before they can scan the next barcode. However, when using an offline service type (‘on-device’) with or without Auto Sync, the app user can continue scanning and the image will upload in the background. If you want to upload an edited photo you should have the app user take the photo with the app in the background and then save the edited version to the device’s gallery. Then when scanning with the app they can select that edited photo from the gallery so it becomes part of the scan record. Step 1: Set up a free account on Dropbox. Depending on your use-case, you may want to upgrade from the Basic plan to a Dropbox Pro or Dropbox for Business account. 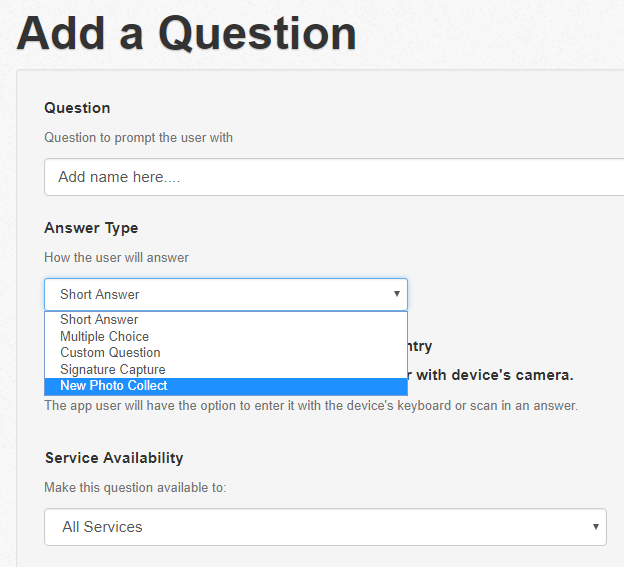 Step 2: Create a New Photo Collect question type on codeREADr.com’s Questions page or when creating or editing a Service. Note: The instructions for photo capture have been updated. Please look at the instructions under New Photo Collect. To Dropbox we’ve also added FTP uploads and will be adding other option in the future. 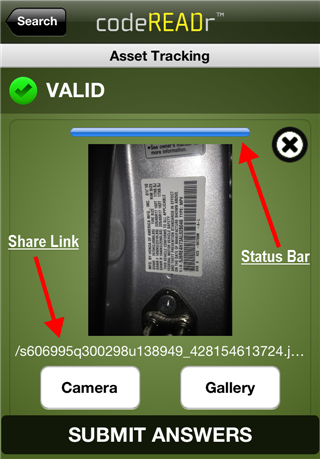 Step 3: When your app user signs into the codeREADr app and scans a barcode, they will be prompted to either take a photo (‘Camera’) or select an image stored on the device (‘Gallery’). Step 4: After a photo has been taken or selected from the Gallery, the process for uploading to Dropbox varies based on the type of codeREADr Service you are using. For both online and offline Services, the app immediately attempts to create a share link within your codeREADr folder on Dropbox in the cloud. If successful creating the share link, the app will automatically upload the photo to Dropbox in the background. The app user can continue scanning once’s there’s a share link and doesn’t have to wait for the photo’s upload status bar to finish. With online Service types, if there’s no Internet connectivity the app won’t allow you to proceed and the photo is not saved locally. At that point, the app user can continue scanning but they will not be able to add photos to these scan records until connectivity is restored or they go to the app’s Settings and turn off Online Scanning. With offline Service types, the app will immediately try to create the share link and upload the image. However, if there’s no connectivity, the app will store the photo locally, create a temporary ID and allow you to continue collecting photos. Once connectivity is available, you can tap the app’s ‘Upload Scans’ button on the ‘Tap to Scan’ screen and the app will create the share link and upload your locally stored photos. The share link URL includes the Service ID; the photo’s Question ID; the app User’s ID; and a Dropbox ID. The share link, not the photo itself, is saved as part of the codeREADr scan record for viewing or exporting or for posting to your server. You can view the image by clicking/tapping the image. If you are a developer, you can grab the image from Dropbox to put on your own servers. In History, the app user can search and view their scans, including uploaded photos. To edit or delete scan records or to replace photos, app users must be given that permission when you create or edit a Service (Advanced tab). They can only edit or delete scan records saved on the device; once scan records are uploaded, they cannot delete or edit them. In Settings, the app user can view and replace images uploaded to Dropbox in the cloud. However, they can only do that for the Service(s) you’ve authorized. 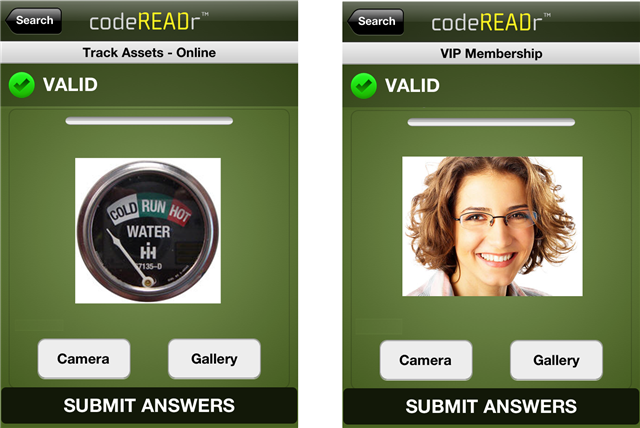 If more secure methods are required, please contact support@codereadr.com. You can add (‘post’) the photo’s share link directly to a validation database so in the future it will be presented to the app-user automatically after scanning that same barcode. Note: You don’t need to capture the photo with codeREADr to display a verification photo after a scan and the photo doesn’t need to be stored in DropBox. You can simply put the photo’s URL in the response text (column 2 of a CSV import). The app user will need to tap that URL if they want to see the photo in-app. You can use HTML to make this link into a button. Alternatively, if you want the photo to automatically load after each scan, you can use our Webify feature to do that. You would put HTML in your response text (column 2 of a CSV import). Once photos are uploaded to Dropbox, with our Export Template option you can create a template for your scan records including the barcode value and all the other data collected with each scan (who, what, when, where, etc.). For the Dropbox photo, you can customize the template to have a clickable URL to each photo in the same row as the barcode value scanned. Also, when you use the codeREADr.com searchable Scans page you will see the photo opened for viewing. That’s also true with the CSV Download Link option’s online view.